The Venezuelan stablecoin and the Russian stablecoin have more of a presence in the news media then on the cryptocurrency exchanges. Despite the economic woes of the Venezuelan economy the Petro has not lived up to its hype. It has been reported by several major news sources that cryptocurrencies like Bitcoin and Dash are where the people of Venezuela have flocked to, in order to preserve what's left of their devalued savings. The Venezuelan Bolivar was devalued by 95% in an effort to counteract hyperinflation. The Russian Crypto Ruble proposal has stalled in the legislative process. The odds of success for the Swiss are much higher than their predecessors. The Swiss economy is not shrouded with instability. The Swiss economy lays claim to having the highest level of nominal wealth per adult, along with the eighth highest per capita gross domestic product globally. The Swiss Franc has gained 75% more purchasing power compared to the USD over the last 50 years. Switzerland is the world's largest importer and exporter of gold. Although it is not in the headlines very much there is also a King of the Netherlands, Willem-Alexander. These attributes about Switzerland just exemplify the level of stability it maintains compared to the economies of the prior stablecoin issuers, Tether, The petro, and the Crypto Ruble. Tether has been surrounded by rumors of inaccurate accounting practices and market manipulation. The Swiss token proposal guarantees monthly, transparent audits for its investors. It's not only the stability of the Swiss economy that makes this proposed token interesting, it's the timing of it. Geneva is well known for its unique brand of tourism. Switzerland has a reputation of being the place where wealthy people go to visit their money. Right now, digital financial transactions are still slower than fiat currency transactions domestically and internationally. Why would a country that has such a dominant presence in international finance move to a vehicle that, for all intents and purposes, is a substandard to what is already in place? The answer to that question may be related to Ripple's (XRP) latest announcement. Ripple (XRP) has announced that the launch of their xRapid payment platform will be very soon, possibly within the next 30 days. xRapid claims it will be faster, cheaper, and more accurate because of the blockchain technology behind it. xRapid can effectively knock SWIFT, the reigning international money transfer king, off of their throne. Some analysts feel that SWIFT has already raised the white flag and has adopted the can't beat them join them posture, predicting an alliance may be forged. And now enter the world's safe haven for money and money transfers, Switzerland. It appears as though a tidy arrangement may be in the making. The developments are still unfolding and XRP's value is rising. These events deserve attention. The 21st Money Team will keep you informed. 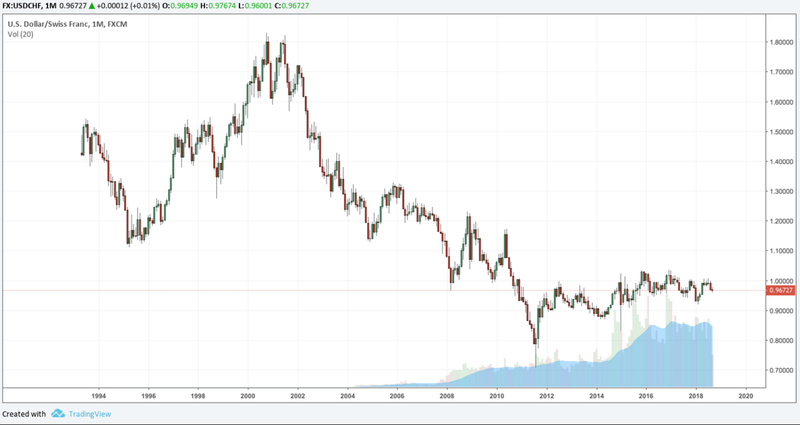 The United States Dollar / Swiss Franc (USD/CHF) pairing helps us understand the historical relationship between two economic powerhouses. The US still reigns supreme as the world's number one economy and Switzerland is the world's Banking capital. Global boundaries are disappearing. Brexit can actually become a reality that will change the economic landscape of the European Union (EU). Bear in mind, Switzerland is still part of the EU. As we enter the digital age of finance will these two currencies still reign supreme? The Swiss franc has a lot more monetary muscle than the USD. The US holds the population with the largest appetite for goods and services worldwide. We'll see how these two economies fit inside the digitized financial jigsaw puzzle that is taking shape. The USD index (.DXY) compares the USD to 6 globally dominant currencies. The USD lost ground when compared to its global counterparts towards the end of the week. The .DXY index recorded a value of 94.5 at the beginning of the week. The Index closed at 94.00 recording a 0.532% loss in value by the week's end. The Mexican Peso held an advantage over the USD throughout the week. The Mexican Peso (MXN) began the week exchanging at 18.83823 / 1. The MXN closed the week at 18.8810 up 0.227%. While the Japanese Yen (JPY) maintained a slim advantage over the dollar at the close of the week as well. The JPY ended the week marginally stronger, pairing with the USD at 111.823 / 1 at the beginning of the week and closing the week recording an exchange rate of 112.748 a 0.827% increase in value. 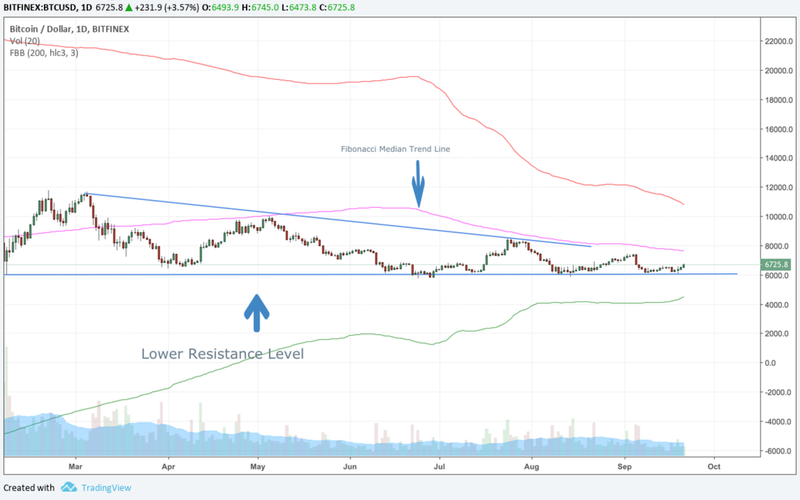 Bitcoin continues to straddle its charted lower line of resistance. The crypto trading community is eagerly anticipating what will be the catalyst for the next bull run. The ETF conversation will not be a factor until 2019 when the Securities and Exchange Commission will review new or pending ETF applications. What could possibly be on the horizon for Bitcoin? Why is it able to maintain this support level near $6,200? "We are now standing at a crossroads, a crossroads facing a choice between globalization or de-globalization. We are encouraged to see the trend of globalization continue to forge ahead at its own pace. …...Globalization has presented China, and all countries around the world, with tremendous development opportunities. In the age of globalization a new round of Industrial Revolution has come into being." The new industrial revolution, is the phrase that really sums it all up. Blockchain technology and all of its applications are still being explored. The full potential of the technology is still unknown. What is known? Bitcoin is at the center of this new industrial revolution, that's a fact. Bitcoin is the cornerstone of digital currency. Whenever Bitcoin nears its lower threshold of resistance and bounces off that line, it is clear that investors and traders share the same mindset as Premier Li. Globalization is unstoppable. There is a unique relationship between blockchain technology and silicon valley stocks. Buy in opportunities that become present in the cryptocurrency market are mirrored in silicon valley stocks. Silicon valley adds depth to computing power and speed to the processing of data available from the internet. Those two factors contribute greatly to the functionality of blockchain technology and its integration into the business models of the 21st century. The silicon valley stock that has caught the attention of The 21st Money Team is NVIDIA Corporation (NVDA). 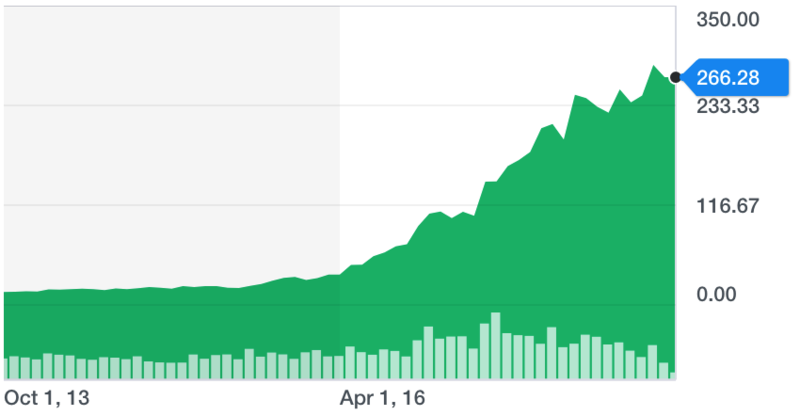 It appears as though the growth of blockchain and NVDA are interlaced. Timely purchases of NVDA stock can potentially lead to astronomical gains as this technological innovation factory helps the world go around with state of the art graphic cards and chipsets. Ripple (XRP) ranks 3rd on the list of cryptos ordered according to their market capitalization. XRP's current market cap is $23,480,000,000. Ripple connects banks and payment providers via RippleNet to provide one frictionless experience for sending and receiving money globally. RippleNet runs on the most advanced blockchain technology. It is scalable, secure, and interoperates with different networks. Customers have optional access to source liquidity using the world's fastest and most reliable digital asset for payments. $842,000.00 worth of XRP changed hands September 21 at an average price of $0.593.